For the first stop of my PEI Burger Love 2017 adventures, I decided to go big with The Piggy Back from Gahan House. The first element I noticed after taking a bite was the granny smith apple chutney, which gave a sweet flavour to the burger, and really complimented the 7oz Island beef patty. I really enjoyed the two big strips of bacon, and the Frank’s crispy onions gave the burger that crunch that everyone loves. My favourite part had to be the sweet sriracha slaw as it gave the burger a nice texture, and it also tasted pretty damn good as well. This burger would have been great just on it’s own, but they went a step further a topped it with a Maple Stout pulled pork slider, which makes this burger stand out from the other 83 offered, while filling that little bit of extra space you may have left in your stomach! 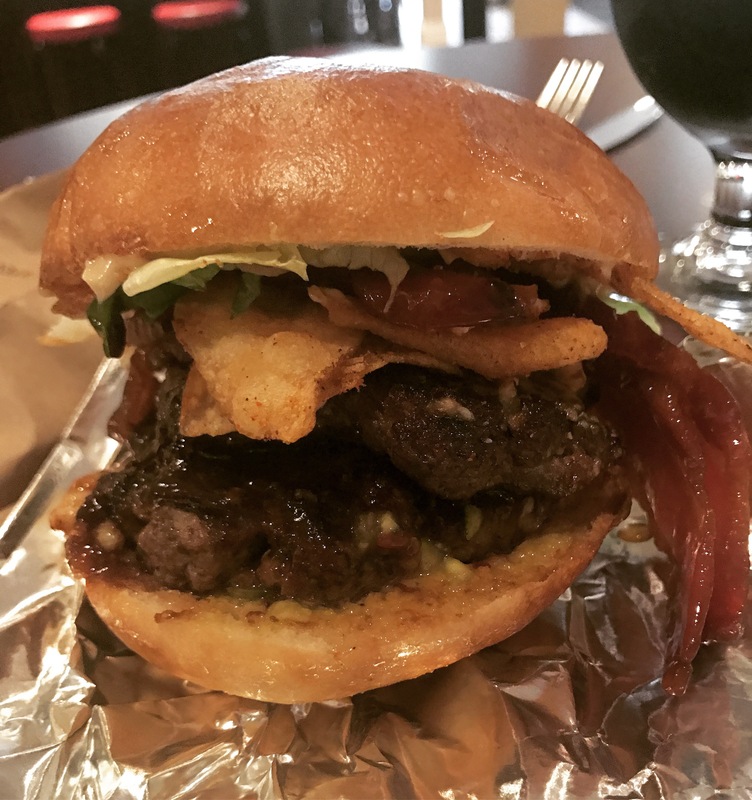 Something that is very clear when it comes to PEI Burger Love, is that the restaurants participating always seem to go all out and create original burgers, that tend to be on the larger side, and Merchantman was no exception. Dubbed ‘The Big Pickle’, it should be no surprise that pickles play a big part in this burger. From the dill pickle slaw to the crispy battered pickles that sat on top of the bun, that delicious dill flavour really came through, and being someone who really enjoys dill pickles, it’s safe to say I was a fan. The hickory-candied bacon was plentiful, and the smoked peppercorn Gouda was dripping out from all sides, almost to the point where it was slightly excessive. Of course the onion rings were a big hit with me (if you’ve read any of my previous posts of burgers with onion rings, this shouldn’t be a surprise), and the smoked paprika aioli really spiced things up and elevated the overall composition of flavours. Overall, a pretty tasty burger that I would definitely recommend to all the pickle lovers out there! As someone who is originally from PEI, I have been to the Olde Dublin Pub quite a few times, but only during the nighttime when drinks and music were the priority, so I had never actually eaten a meal there. Completely unsure as to what the food was like here, I picked this as a Burger Love stop purely based on the burger description. This burger was fairly basic in concept, but it did have some pretty tasty components. The bacon was delicious, and while I’m not exactly sure what it is made up of, the ODP super sauce gave a creamy, and flavourful, addition to the burger. I was a big fan of the tempura-fried onions and the crunchiness they gave the burger, and there was a nice pile of them so that was a plus. My one complaint about this burger was how greasy it was. When I was finished eating, there was a puddle of grease on my plate, which was kind of off-putting, but if you’re able to look past that, The Dub Boss does have some pretty redeeming, and delicious, qualities! I’m a big fan of the beer that the PEI Brewing Company puts out, so when I heard that their Burger Love entry this year would feature ingredients made from their brews, I knew I had to make sure I stopped by (it also helped that their burger for last year was also insanely delicious!). The first thing you notice when the burger is placed in front of you is the bright red toasted poppy seed bun. While this bun does catch your eye, and makes the burger really stand out, it was a bit drier than I would have liked. Other than that, everything else about this burger was great! There were two types of bacon, spicy Beach Chair lager bacon and maple-candied peameal bacon, and both were juicy and awesomely delicious. The crispy hash brown gave a perfect crunch to the burger, and the yolk of the fried egg coated all the components in gooey greatness. The IPA BBQ sauce gave the burger a bit of a pop, and I really enjoyed the coffee-rubbed beef that made up the 6oz patty. This burger, while very dense and filling, is the perfect cure for both an empty stomach, as well as a painful hangover! A relatively new addition to the Downtown Charlottetown food and beer scene, Hopyard is a place that I had not been to before, but had heard a lot of great things. With an ever-changing beer and food menu, Hopyard appears to be a place that likes to keep things fresh and new, so I was expecting something truly unique from their Burger Love contribution. After the first bite, I knew I made a good decision in making sure I stopped in to try their burger. They switched it up and used two smaller beef patties (3oz each) instead of one larger one, and the beef was delicious and juicy. The crispy ale-salt potatoes softened a bit from the burger juices, but still provided that salty potato flavour that you just can’t say no to. The IPA pickle relish was sweet with hints of pale ale, and I loved the thick slices of Sugar Shack bacon! My favourite part was easily the beer gravy. A generous portion of the savory sauce coated the whole burger, and while it did make it somewhat messy, it was definitely worth every single drip. This is not one to be missed! I’m the kind of person that loves a saucy burger. With the perfect amount of a tasty sauce, you can turn an ordinary burger into one your taste buds will love. Water St. Fish & Chips has pulled out all the stops when it comes to their Burger Love burger, and created one that explodes with flavour! A spicy buffalo chicken wing sits on top of the soft potato scallion bun, which does a great job of containing the numerous condiments found inside. There was tons of the pulled BBQ chicken, and the crunchy chicken skin chips made it taste like there was a big piece of fried chicken right in the middle of this burger. My favourite part was easily the roasted garlic and celery leaf aioli. It had a nice savoury taste, while providing that amazing creamy texture to every bite. Even though I did find the beef to be slightly overworked, this burger was a really nice surprise, and it was one of my favourites from the week! For last year’s Burger Love, The Brickhouse created a towering burger that was packed full of onion rings, and was all kinds of awesome. Thanks to such a great experience last year, I knew I was going to go back this year, no matter what the burger was! This burger is pretty simple in concept, but there are some great flavours between the buns. The 7oz beef patty was juicy and tender, and it was smothered in a melted cheddar blend. There was two big pieces of the maple-candied bacon, which had a subtle sweetness to it. The deep fried pickle chips were the stars of the show, and the addition of the cheese in the chips worked really nicely in the battered pieces. This one is a great choice if you are more of a ‘classic burger’ person! I decided that it was only fitting to pick this one as my last burger before heading back to Halifax. A huge pile of different desserts is what this one is all about, so much so that calling it a burger is a bit of a stretch, but I’ve got a major sweet tooth, so I had no problem giving it a shot. I will say right off the top that the beef patty seemed to be just something that was added so that it could meet the burger requirements. I didn’t really enjoy the beef with any of the sugary items, as the flavours just did not work together. I did like the bacon with the caramel sauce though, as it gave that delicious sweet and salty combination. The funnel cakes were fluffy and warm, and the deep-fried Mars bar had a warm, gooey center that was amazing. The ice cream cone on top was the perfect size to wash everything down at the end, and although I wouldn’t necessarily call this a burger, it was a nice sugary end to a very beefy week! Let me know what your favourites from PEI Burger Love are over on Twitter and Instagram!